The apology carried in the Sunday Times, October 14, 2018. 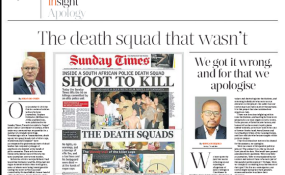 This last weekend, the editor of the Sunday Times Bongani Siqoko issued an apology for the reporting done by the newspaper on the Cato Manor death squads and the Zimbabwe rendition saga. And two years ago, the same editor apologised for the SARS "rogue unit" reports. The latest apology has led to a range of commentary and opinion, and a lot of outrage about the state of South African journalism in general, and about the Sunday Times and its reporters in particular. I too am outraged. But not for the same reasons as everyone else. Mine are specific to the traditions of the craft which has been my lifeblood for almost 35 years. I would guess that the broader public doesn't really think about the complex matrix by which a news publication gains the trust of its readers over time. Readers probably also don't think about the internal processes in which trust and credibility are made and maintained. As a start, here's my understanding of how it should work. Let's imagine a newspaper in a city (go with me on this, I do know that such a thing no longer really exists, but situating it in this way might make it easier to understand). The newspaper has an editorial policy, perhaps left-wing, or right-wing. It is "on the side of the people" or it is a business publication. Its readers understand these editorial positions, and make their own interpretations of what they read based on that understanding. It has reporters, the people who go out and gather the news. Reporters are a varied bunch, but some traits are inherent: disregard for authority, curiosity and general bolshiness are a given. Some are careful, dogged types, and others are arrogant and egotistical. Some hunt for a scoop. Others want to hold truth to power. Some just want a quiet life, perhaps as a municipal reporter. All live to see their byline in the paper. In general, though, they are a troublesome lot, because they have to be. And some of them, some of the time, are so driven by ego that they may be susceptible to manipulation (as so eloquently described here by Tom Eaton – subscription required). When any one of these reporters is sent, say, to cover an event in which the mayor opens a new housing development, their report on the event is read by everyone who was at the event (or at least the dignitaries who were there). If they interview a local business person, that person and his or her business scrutinise the report for accuracy. When a reporter covers an event at a local school, every single teacher and parent at that school read the report and note whether it reflected the event properly. And over time, the reporter's name (and his or her publication) becomes trusted – people know that if he or she says it happened, then it did. That's how external trust is established. When reporters start to investigate hidden wrongdoings and skulduggery, things become dangerous. The troublesome reporter is now working on the margins of society, getting leads and information from sources, some of whom are shady, and all of whom have their own agendas. There is always the chance that something can go wrong here. There's a system to deal with this that has been in place at news publications all over the world for decades. With some variations, and differences in how things are named, here's what happens to that big scoop from well-placed sources. The first line of defence is the news desk, usually staffed by experienced people who have themselves been reporters. They will read the scoop, narrow their eyes and ask penetrating questions about sources, facts and background checks. If they think there is something amiss, they will send the reporter back to the drawing board. They will also talk to more senior staff and alert them to the fact that the story is on the radar. In many cases, the story idea may have originally come from the news desk, or those more senior editors, and may be worked on by a team of people, or be done by a specialised investigative unit. But in all cases, a range of people – many of them experienced – work on a story of this nature. If it is decided to go ahead and publish, the story will then be edited by another team of senior people (in South African terms, the sub-editors), who will read it and question it and think about it. If they are worried about aspects of it, they will alert their boss (the chief sub-editor). That person may double-check with even more senior people that this or that aspect of the story is correct, or whether a particular inconsistency has been spotted. If these objections are substantial enough, the story could be sent back to the news desk be worked on again. At the top of all this sits the Editor, who will usually have a deputy and one or more assistant editors to consult. But he or she carries final legal responsibility for what is published. The Editor is the one who will have to go to court if the sh*t hits the fan. The legal aspect of it is not the most important thing to understand about all this, though. It looks from the outside as if this is a very top-down, hierarchical structure, and it is. But what is not seen, unless you have lived in this world, is the hidden underpinning of mutual trust that makes it all work. In this system, everyone has everyone else's back. The hungover reporter who has the scoop knows that all these senior people are there to protect her from herself, that they are there to make sure that the story stands up. The crabby news editor knows that the taciturn chief-sub is not going to let something through that shouldn't get through. The editor and his or her staff know that all these people are there to keep things straight, to make sure that the publication is not going to be shamed or found legally wanting by something that happened on their watch. These are the ties that bind journalists more closely than anyone outside the profession can ever understand. There is also a system of clear accountability. If the news editor somehow misses something, and a story gets published that shouldn't have, he or she takes responsibility. They never, under any circumstances, blame the reporter. The chief sub never blames a sub-editor. The features editor never blames the food writer. And the Editor gets paid the big money and never blames any of these people. If it happened under their command, they take the fall. The buck stops on that big and fancy desk. Much of the public anger for the wrongs done by the Sunday Times is focussed on the reporters who wrote the stories. There have been many calls for them to account for the damage that the reporting did. They are culpable, certainly, and I see no reason for them not to name their sources now. I second Max du Preez's call for a forum to investigate the matter. But I know who should be standing in front of that forum, and it is not the current editor of the Sunday Times. In the traditions of journalism, someone else is supposed to be stepping forward and taking responsibility. Ray Hartley and Phylicia Oppelt, who were the editors of the paper at the time of these disputed reports, should come forward and explain how it is that the systems failed, how it is that the trust that underpins all journalism was so badly broken, how it is that journalists in their employ were captured without their noticing. They should have the balls to say: This is on me. Their not doing so is one of the most shameful things I have ever seen in journalism. They dishonour all of us. The system of checks and balances I describe here has been decimated at many publications, as declining revenues affect all of journalism. Please consider paying for the journalism you consume! Renee Moodie is a South African journalist who has worked as a reporter and sub-editor on the Cape Times and the Cape Argus. She was deputy editor at Independent Online, and is now running a content and web services business called Safe Hands. This article was originally published on her blog. Follow her on Twitter or visit her Facebook page.